Cartier aquamarine and diamond ring. You are here: Home / Jewelry / Aquamarine and diamond ring by Cartier. 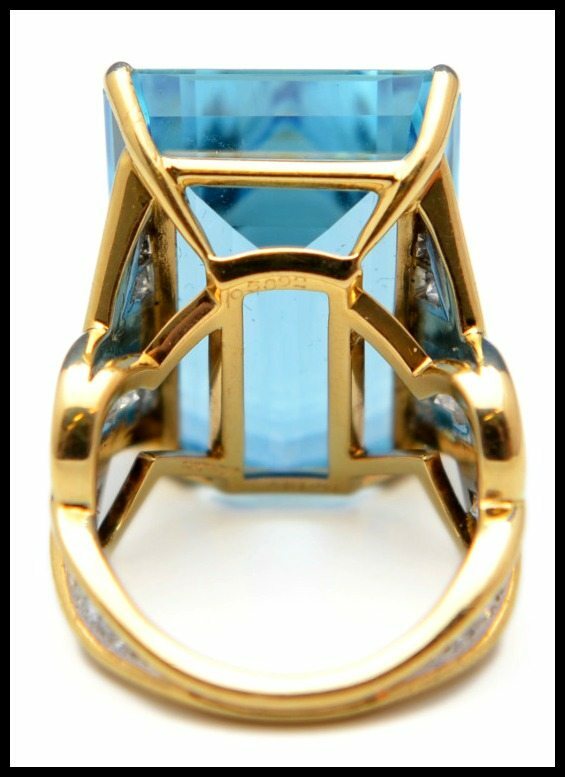 Aquamarine and diamond ring by Cartier. This aquamarine and diamond ring by Cartier was going to be a Tumblr post, but I couldn’t bring myself to shrink it down. The longer I looked at it, the more I realized it needed its own blog post. Not too shabby, right? That’s a 28.50 carat aquamarine in the center there. (Fun fact: it’s my birthstone!). The choice of 18k yellow gold here gives this piece a retro feel, but it’s contemporary. How do you like that gold and diamond lattice on the side? I think it’s just fantastic. So bold, but still thoughtfully designed in a way that doesn’t let it feel over-the-top ostentatious. This is actually my favorite part. In a totally unnecessary but utterly fantastic move, the diamond inlay continues around the back of the shank. It would have been so easy not to add this final detail, but because Cartier is Cartier, they understand exactly what’s necessary to make this ring an A++++ instead of just an A. Look how wide open the basket is, too – I bet that aquamarine sparkles like nobody’s business in a wide-open setting like that. An exceptional piece; a cocktail ring worthy of gracing the most fabulous of hands. 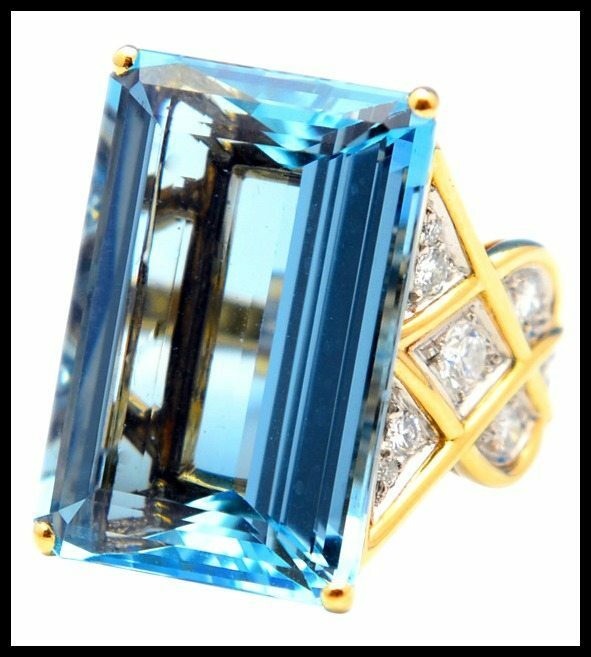 This Aquamarine and diamond ring by Cartier is currently for sale by J.S. Fearnley via 1stdibs. All images and info are thanks to J.S. Fearnley and 1stdibs. Why is it easier to find an Aquamarine with great clarity than an Emerald? 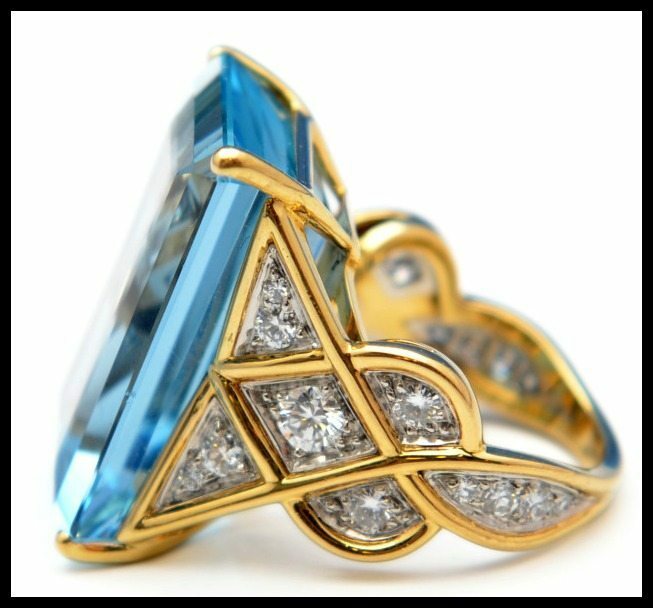 I would kill for a ring like this one.Still I doubt I would have many occasions to wear it so … I agree with you – the design is impeccable and the colors complement themselves (that’s why I suppose they made it in yellow gold). I love the fact that the main stone is rectangular. It’s 10:54 am on the east coast, and the ring has already been sold. The stone is stunning, and I like the design, but I have to admit the yellow gold is a no for me. I prefer white metals in general, but especially with aquas.